So we absolutely LOVE Speech Language Pathologists and know that they can bring so much to the field of literacy intervention. As an SLP it can be hard to determine if such a broad scope of practice is a good thing or a bad thing but the bottom line is that with your training in the development of language you are often best positioned to support students with language-based literacy disorders. Well, here’s the deal and we feel like we can say this because we ARE literacy interventionists. Traditionally, literacy interventionists don’t have training in the development of speech sounds, the development of language and the processes required to remediate language - and that’s okay right? Because that’s YOUR area. But the problem is that we as literacy interventionists often realize (or don’t realize, which is okay because it’s not our area after all) that language barriers are continuing to hold our students back! Because we know that the literacy processing triangle requires semantics and phonology (which are both language skills) all coming together we can’t negate the importance of language skills on developing reading and writing. As literacy specialists we get very stuck on the orthographic (letter or sound-symbol) component and we leave everything else off the table. But we can’t develop reading and spelling without language skills being intact. And more often than you might imagine students with reading and writing struggles have underlying language struggles and they need YOU to help support them. So you need to realize first, whether a child you are working with may have literacy deficits and then if they do, if the literacy deficits are the primary deficit meaning we should focus intervention there first or if the literacy is secondary to the language deficit in which we should focus intervention on language while sprinkling in literacy tasks where possible. 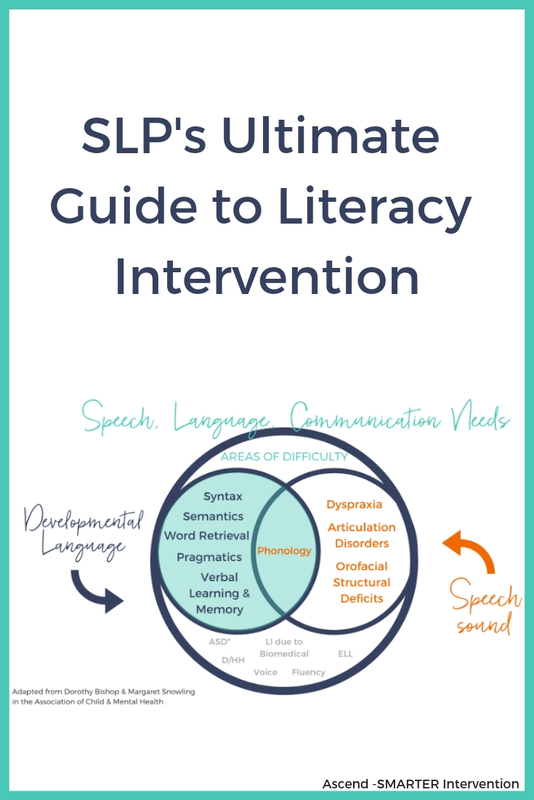 Check out this week’s Freebie Friday which will begin to outline an SLP’s role in literacy! And some tips to help get you started.